A new study, published today in the journal Proceedings of the National Academy of Sciences (PNAS), found that only 41% of today’s natural areas are sufficiently connected to allow plants and wildlife to remain in their optimal climate. Animals need “little plant and animal highways, paths that make it easier to move and disperse over the landscape,” Jenny McGuire, study author and research scientist at the Georgia Institute of Technology’s School of Biology, told Business Insider. Jenny McGuire, Georgia TechMap shows the regions of the United States from which plants and animals will be able to escape predicted climate change. Blue areas are where they will be able to succeed given current conditions, orange areas are where they will be able to succeed only if they are able to cross over human disturbed areas, and grey areas are areas where they cannot succeed by following climate gradients. 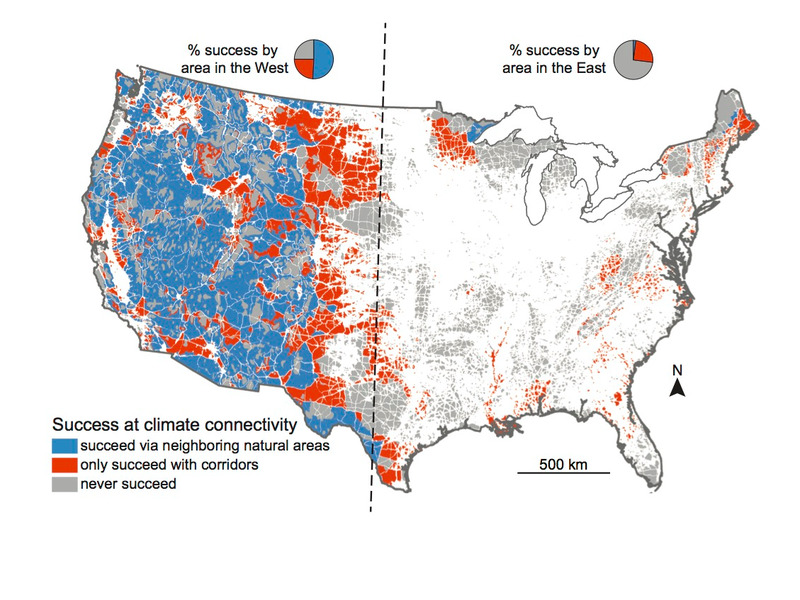 “An important contribution of this [PNAS study] is that it helps us, ecologists and managers, prioritise limited funding for research and habitat restoration efforts, by focusing on areas of the US where it will have the biggest impact on improving connectivity of habitat corridors for species,” Dr. Nate Nibbelink, associate professor of spatial ecology at the University of Georgia, told Business Insider. He was not directly involved in the study. Habitat corridors have already been created in a few places. Wyoming has begun to invest in wildlife overpasses, while researchers are working on digging tunnels for amphibians under busy roads, and North Carolina is working for to connect bogs.